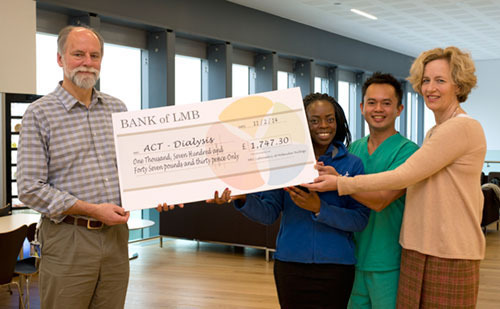 Staff at the LMB have raised over £1,700 from their annual Charity fundraiser for the Addenbrooke’s Dialysis Centre in memory of former colleague Michael Neuberger, who passed away in late 2013. This cause was chosen by Michael’s wife Gill in appreciation of the care and support Michael received at the Centre, where he spent many hours over several months during 2013. The money was recently handed over by the LMB Director and Gill Neuberger to the Hospital via ACT, the independent registered charity for Cambridge University Hospitals NHS Foundation Trust. All members of the LMB were thanked for their efforts in raising this record amount.